Almost every operational aspect of corporate legal departments has changed over the past several years. Increases in reporting and compliance activities are matched by budget constraints and the encouragement to do more with less. Legal fees continue to grow, untested legal service suppliers appear, and standard practices are no longer standard – they’ve been modified for a new environment. To stay on track, legal departments are relying more on advanced application tools and data-driven decisions. Your CounselLink Enterprise Legal Management (ELM) system is ideally suited for this role. However, in these dynamic conditions, it may be time to reexamine business processes and technology approaches to see if you’re still aligned with strategic goals and delivering the best possible results. 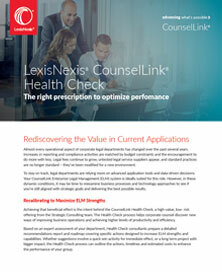 Achieving that beneficial effect is the intent behind the CounselLink Health Check, a high-value, low- risk offering from the Strategic Consulting team. The Health Check process helps corporate counsel discover new ways of improving business operations and achieving higher levels of productivity and efficiency. Based on an expert assessment of your department, Health Check consultants prepare a detailed recommendations report and roadmap covering specific actions designed to increase ELM strengths and capabilities. Whether suggestions involve a quick win activity for immediate effect, or a long term project with bigger impact, the Health Check process can outline the actions, timelines and estimated costs to enhance the performance of your group. The assessment process starts with a brief questionnaire; your responses help strategic consultants begin to understand the current operating environment, challenges, priorities and overall goals. On-site sessions are the next step. Consultants schedule meetings with key stakeholders from senior management, finance, legal department operations and system administration. These guided discussions uncover further details about strategic initiatives, organization, practices for handling matters and legal spend, accounting rules and other functional requirements. The Health Check process concludes with the recommendations report and roadmap deliverables. Operational suggestions will vary considerably for each department and may involve fee structures, formal training, budgeting practices, vendor management and other activities, including those that do not directly impact your CounselLink solution.